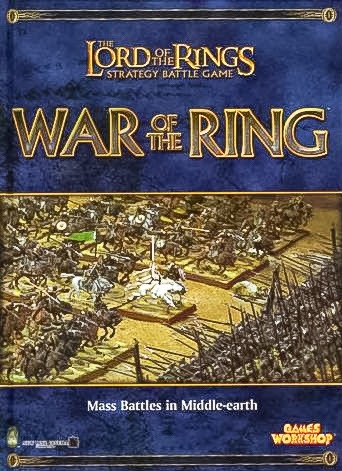 It's been a long time coming, but I have finally played my first couple of games of War of the Ring. For a decent overview of the game, have a look at this article on BOLS. For a very detailed look at the rules, check out this article on RPGnet. As both reviews noted, the game plays like a hybrid of Warmaster and Warhammer. The rules are quite streamlined and quick to play, with just one table to memorise - ideal for the more mature gamer! Everything you need is in just one book. The rules, army lists, modelling section and scenarios, all in one big blue book, which is no longer in print but can be picked up on ebay for around £10, quite a steal for a hardback book containing more than 300 pages of the usual GW quality content. Here's a shot of the first game, as you can see we are still working on the movement trays, but it gives a good idea of the look and feel of a typical game. 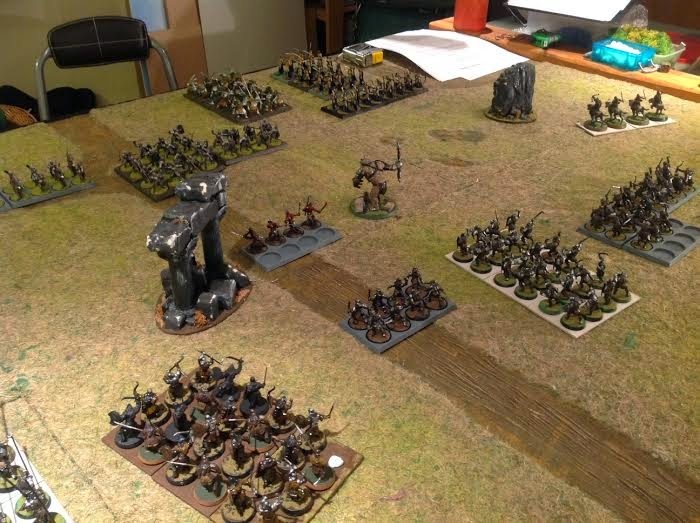 Note the orcs on the right moving up in a column formation, when they charge they can fan out into a wider formation to maximise attack potential. The game is played in turns, split into movement, shooting, charging and combat, but in an alternating sequence. Players roll at the start of the turn for initiative, then player1 moves his troops, then player2 moves his troops, then player1 shoots, then player2 shoots and so on. I prefer this system, there's far less down time waiting for your opponent to complete all phases. It makes the game feel more engaging, you only have to wait a couple of minutes before you are called on to do something. Movement is a straight forward affair. All units have a move allowance measured in inches, formations are free to move in any way as long as the companies do not exceed the move allowed. So a formation could turn, or move into a column, or widen it's frontage, or just plain old move forward. Terrain and enemy proximity halve the movement distance. That's basically it, the rules for moving are covered in just four pages. It's neat and quick without loads of measuring and fiddling that some systems insist upon. Charging is performed in a similar way. Pre-measuring is allowed, then there's a dice roll with an amount (dependent on unit type) added to see if the charge reaches the enemy. If it does not, the charger simply remains where he started. If successful, the companies move up and fan out, not necessarily remaining in the same formation they started in. I find this to be quite realistic and satisfying, compared to the rigid charges of other systems. Shooting and combat are very similar, both use the same mechanics. The attacker first calculates how many dice he will use, better fighters/shooters get more dice and there are other bonuses for things like charging, or penalties applied if attacked in the flank or rear. Once the number of dice is known, the player then looks up on a single chart the score required. For each success, a casualty is caused. Thus, both shooting and combat resolution is performed in just one dice roll - considerably speeding up the game. 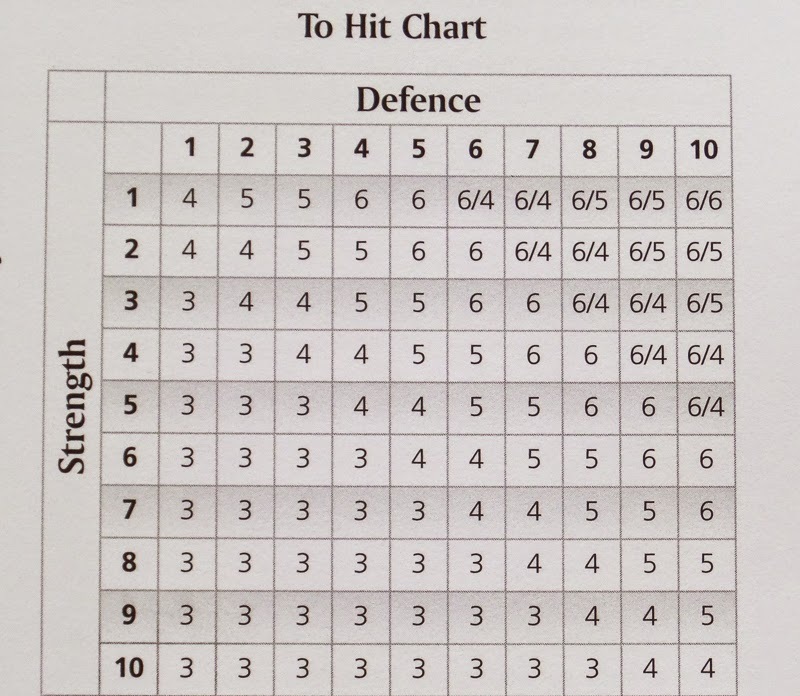 There's no roll to hit, roll to wound, roll armour save, roll parry save - it's all performed quickly and neatly in just one roll. Casualties from shooting might cause a formation to be pushed back. Casualties in combat might see the unit take even more casualties, or become disordered, or resolutely dig in and refuse to give ground. At the basic level the game plays smoothly and quickly. The rules are simple and logical for the most part, though the shooting stat is an oddity. For some reason a higher shooting stat means poorer shooting - probably this was the old "to hit" value in the skirmish game. There's also very little in the way of morale. There's no panic when nearby units are butchered, or for other unsettling events. But for the most part, the basic rules give a very reasonable and satisfying wargaming experience. Characters and magic add greater levels of complexity and strategic choices, but I need a few more games before I can properly comment on this part of the game. It's a bit like moving from draughts to chess, there are far more possibilities and combinations to ponder, so I will come back to this in a future post. 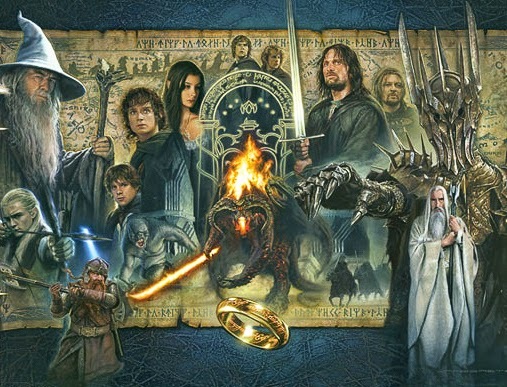 So far, with a grand total of two games under my belt, I am really enjoying it and looking forward to delving deeper into Middle Earth. Who knows what will be awakened? 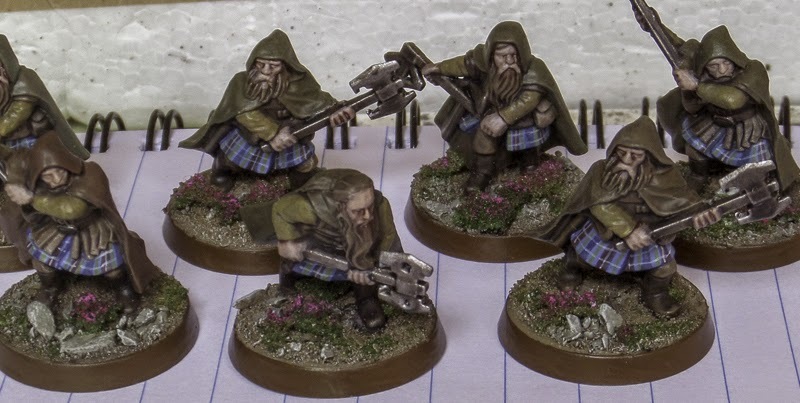 The first set of dwarfs from my Lord of the Rings collection, ready for tabletop action. These are fine figures for the most part, I like the aesthetic probably more than their Warhammer cousins, though being one piece plastics there is the element of duplication and sometimes the details merge into one. But all in all, I would rank these highly in my collection. 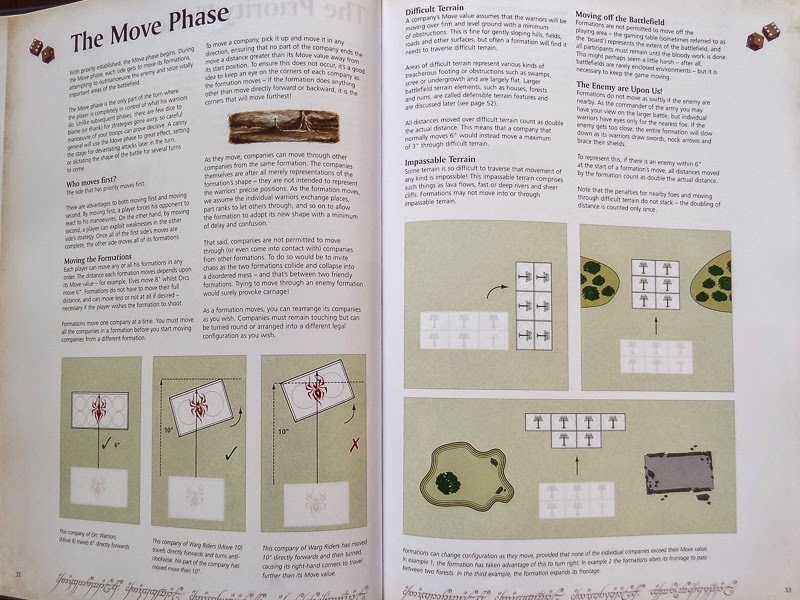 The photos below show them arranged in eights, as per the War of the Ring rules, though I am hoping to use them in Saga and other skirmish rulesets too. The colour scheme came about in two ways. Firstly, they were sprayed brown and washed, I wanted to speed through the leather bits without too much actual painting. The kilts were a bit of whim on my part after a visit to Scotland, I had a hankering to paint up some tartan! I'm sure it will not be to all tastes, but I like them. With those two elements in place the rest of the palette just slotted into place. I drew up a full set of step by step instructions on the painting, it will be useful to me in the future if nobody else. They can be found here - Step 1 Step 2 Step 3 Step 4. 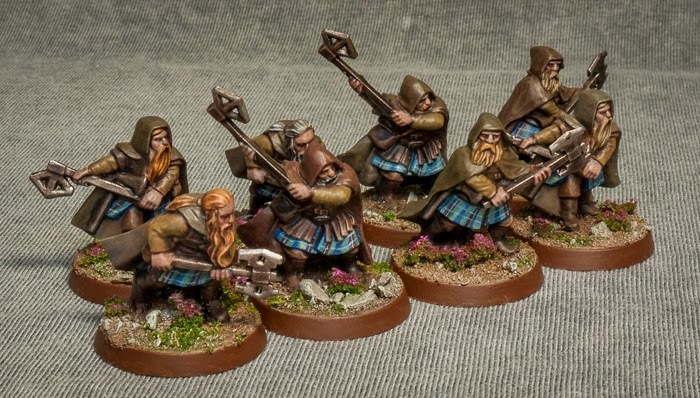 These rangers are just the first wave of my dwarf force. I have more armoured warriors waiting to be prepped and painted, maybe even in the next few weeks. In the final straight now, the dwarfs are nearing completion. These last two stages should have the dwarfs sprinting over the completion line, in the way only dwarfs can sprint. The flesh gets a wash of diluted coat d'arms Super Wash Light Brown. Once it's dry I will add a bit more in the eyes and mouth if necessary. The heather flowers are just stippled on to the dried flock bushes, using a magenta colour for the base and then a little pink added for the highlight. I also painted the edges of the bases with coat d'arms dark leather. The beards are the final stage, probably the most significant feature of dwarf models. The basic principle is to paint the base colour, glaze it once or twice, then maybe retouch with the base colour and highlighting. 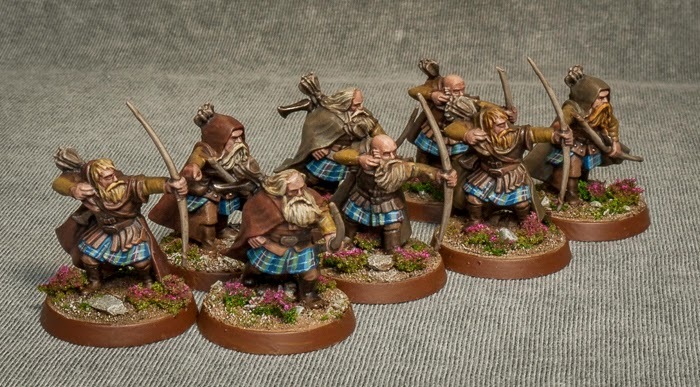 Compared to the other stages (with the possible exception of the kilts), it's more time intensive and requires greater care, so I tackled the dwarfs eight at a time. I tend not to stick to rigid recipes for hair and beards, I want the variation that mixing paints brings. Earthy browns and yellows form the basis, washed with browns, then highlighted again until I am happy enough. And that's it - speedy dwarfs done! Except for the pesky bowmen, they have their weaponry outstanding too. And I will probably add a coat of varnish, not for protection, just to dull down the shine from the glazing. Better pictures of all three completed units coming soon, for some reason blogger seems to remove most of the colour when I post these. The dwarfs are plodding forward. This is a particularly boring phase, adding the base colours of the flesh and the sleeves. The latter I have gone with a dull yellow, I thought it would add a natural contrast to the blue of the kilts. I also washed the bases with a brown and then stippled on the yellow sleeve colour. That's it, sounds like little but it takes a while on the skin. In this step I have done the bulk of the basing work. I picked out the rocks and stones in a khaki colour and then drybrushed them and the base edges with a light grey. Then I tore up some flock and soaked it in diluted pva glue before adding it to the base. When it dries fully it will be rock hard and I can then add some flowers by dabbing paint on the top of the "bushes". Granite boulders and heather shrubs is the look I am aiming for. More work in progress updates. I seem to get a real spurt of enthusiasm at this time of year, it feels like the start of the new year, guess it goes back to school days. While I wait for my Dystopian Legions starter set to arrive, I am keeping busy with dwarfs and the orc (one to satisfy my speed painting urge, one to satisfy my aspirational painting urge). So more pictures of brown lumps for the time being I'm afraid. I painted the cloaks in a very similar fashion to the leathers, by applying a thin coat of paint over the brown underlayer. I used muted greens, browns and chestnut for this stage. Once they were dry, I very gently highlighted the cloak edges and folds by lightly drybrushing with a slightly brighter version of the base colour. This took a good 90 minutes to do, so I decided I was near the end for this day's painting and applied the metal basecoat. I like to allow the metal paint a good overnight drying period before I apply washes. The next day, with the metals well and truly dry, I washed them with a mix of black paint and chestnut ink, my standard way with armour and weapons. If needed, I applied a further wash on a second pass. 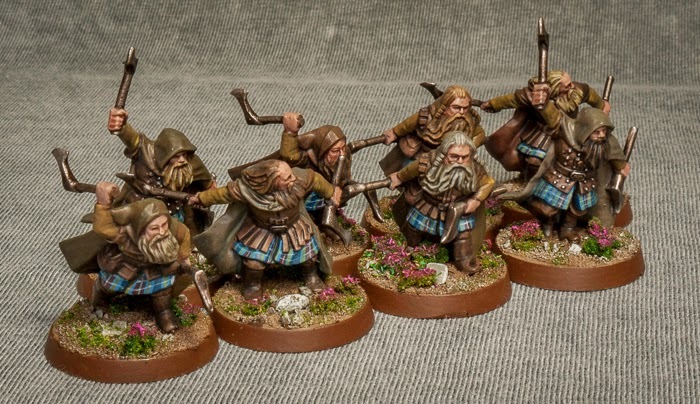 And then it was time for the most significant step to date, the one that will probably have most impact when they are lined up for gaming - painting the kilts. For this I turned to a scarf I had bought on a recent trip to Scotland, as inspiration for the colours and basic pattern. I started by applying a dark blue base, over the top of this I painted light blue stripes. Then I filled in every other dark blue stripe with chestnut. Then it was on to a finer brush to paint fine yellow lines on the light blue bits. Finally I painted white lines over the chestnut stripes and then horizontally across the whole kilt. The end result is quite bright, I glazed over it with a blue black mix. It still looks a bit bright, but that's because the rest of the palette is so muted. 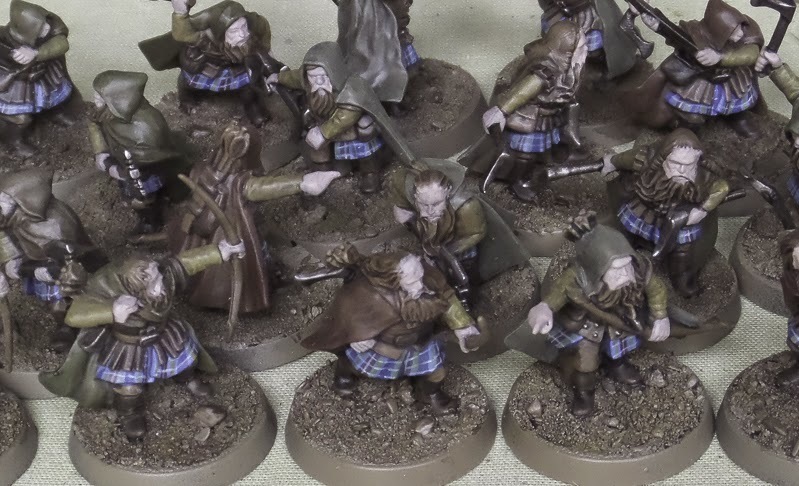 When the flesh and beards and bases are complete, I will review if the kilts need further toning down with a second glaze. 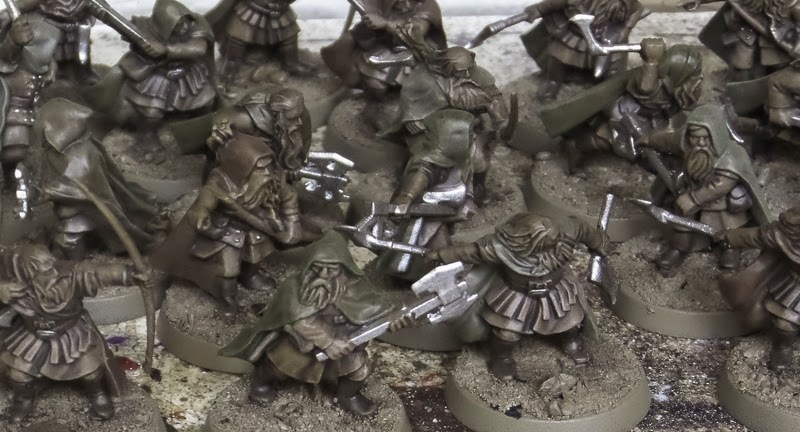 Another little project I have on the go - speed paint some dwarfs for my Lord of the Rings collection. Having recently picked up some Bolt Action coloured primers, I wanted to try them out on some troops. 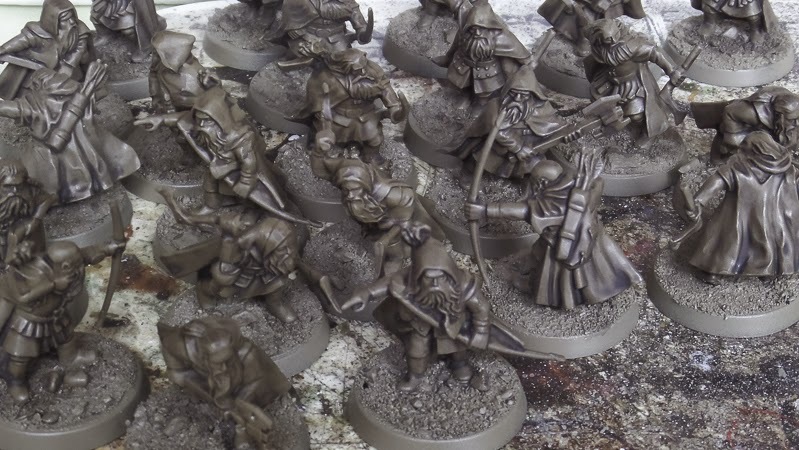 Brown seems a good fit to dwarfs rangers, they are wearing leather jerkins and boots, if the primer plus wash can take care of those elements, it's a considerable time saving. As an experiment to see what could be achieved, I cleaned up 24 rangers and primed them brown. Then I put on a guiding wash, to provide some elementary shading and lining. I split the rangers into 3 batches and tried different washes. The first batch got army painter strong tone diluted with matt varnish, the idea being that it would remove the shine and soften the tone a little. The second batch got pure army painter strong tone, the third got pure army painter soft tone. In retrospect, I should have washed one batch with my usual mix of black and brown paint plus matt varnish, for a control group. Alas, I did not. All three groups were a little disappointing, the wash didn't really adhere as it usually does and pooled a bit more than normal. I don't know if this is due to the primer or the wash, which is where the control group would have been helpful. Anyway, moving on with the experiment, I gave all 24 a second coat of pure strong tone and it seemed to adhere much better, though still with a little more pooling that I am accustomed to. I was reasonably happy with the leathers, but felt that a little variation to break up the wall of brown would not go amiss. A very light drybrush with a leather brown colour added a little extra definition on the quivers, belts and jerkins. Again, in retrospect, this maybe should have been done all over the models prior to the wash. Then I mixed up a brown and black wash, with a spot of matt varnish, to pick out the boots and other leather areas. The idea here is to add some variation to the browns. On some models I painted the belts, on others the jerkins, and all the boots got this darker tone. It's a quick step that really pays off in adding some tonal variety, as hopefully the photo illustrates. 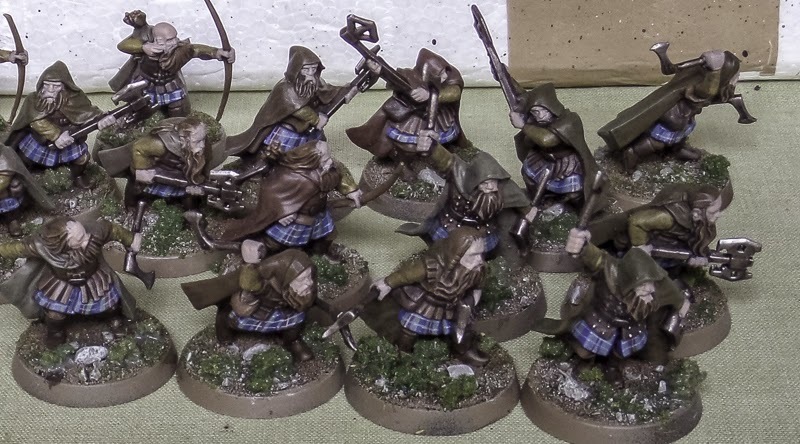 The next step is to decide on the colours of the remaining cloth areas - the sleeves, trousers,cloaks and kilts. Yes, kilts. After spending a few days break in Scotland, I was really inspired by the history and colours of highland warriors, so I will be browsing the web for inspiration. 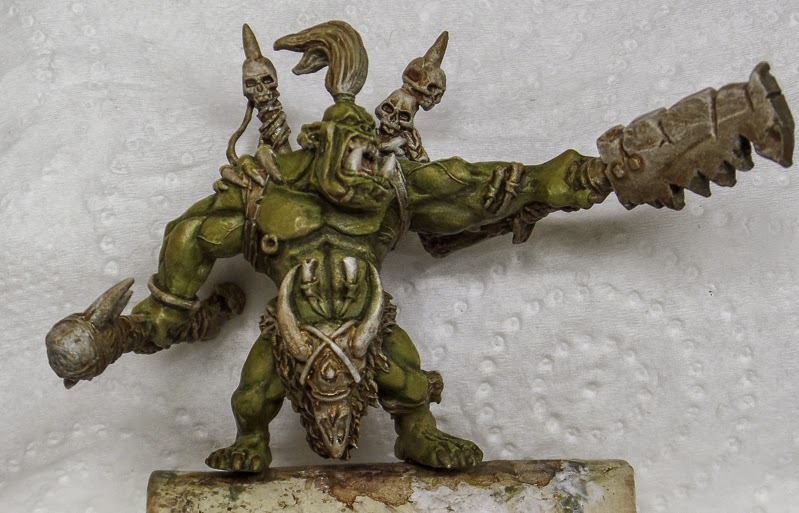 Another 90 minute session on the orc, working mainly on shading the skin and adding in a few more base colours so I can get a good idea of the overall composition. Much of the work I did is not visible in the photo, I was working on the areas of the skin that are mostly in the shade. If you imagine the light shining above his head, coming from the direction of the axe, then the skin where less light falls would be his back and the other side of his arm. I also added shading in the underside of his outstretched arm and on areas joining pelts, straps, etc. The shade colour I mixed by adding two different shades to the mid tone base, which if you remember was Vallejo Camouflage Green. The shade colours were Coat d'arms Rust and Privateer Press Coal Black. The Rust added to the green gave a nice dark green, while the Coal Black added in gave almost a purple shade. 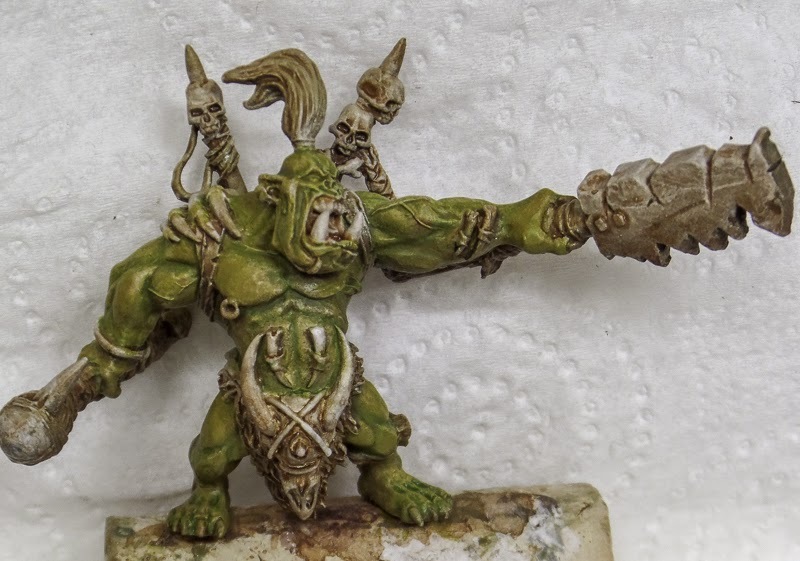 I also picked out the fur skin loincloth in Coat d'arms Beige Brown, then shaded it with Army Painter soft tone wash. This is the first time I have used these washes, this figure is becoming a real testbed of new techniques and materials! 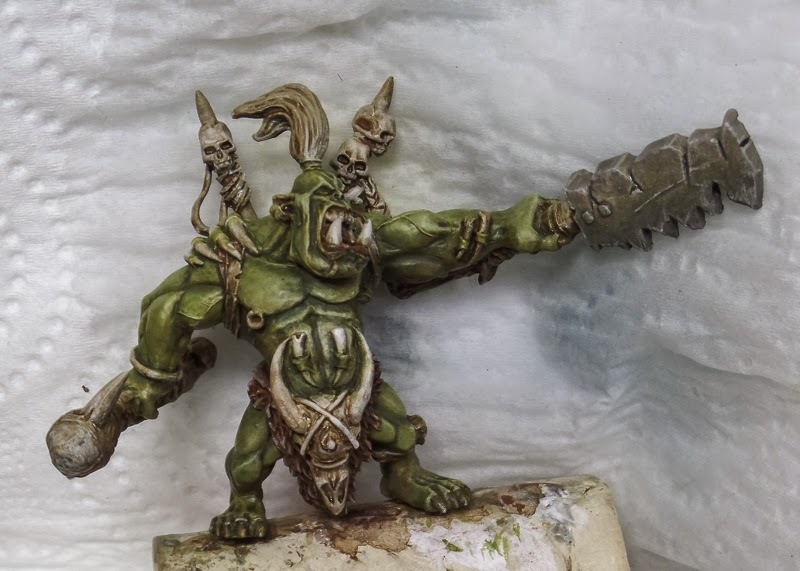 Finally in this session I painted the axe head, with a khaki colour, before shading with some of the colours remaining for the skin shading, then highlighting with a light grey. That's it for this week on the orc, there will be a short break while I take a trip north of the border to Scotland for a few days. I won't be taking my paints, but I will take a few books to read and some plastic sprues to cut, clean and glue. Holidays are better if they include an hour of hobbying each day. The first area I painted was the skin. 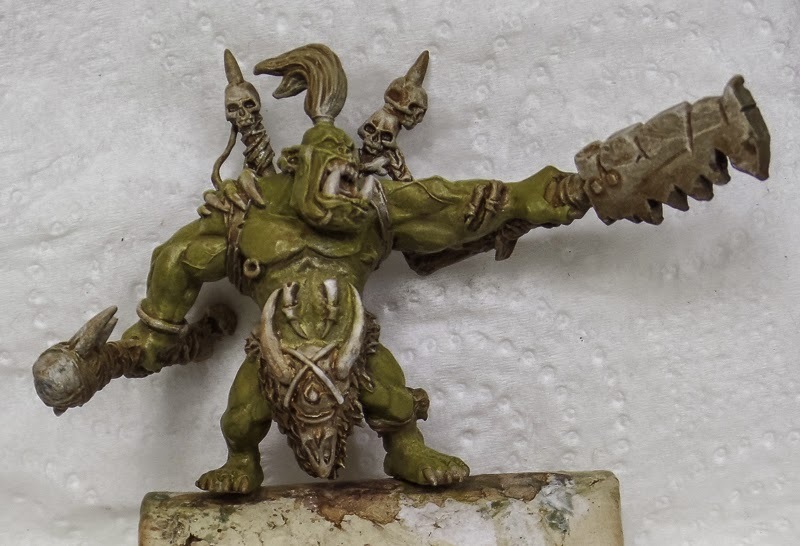 The basic principle I had in mind was to keep the paint thin, so that some of the underlying shading provided by the priming stage would show through. I am not sure this really happened, but it did help to have the areas of light and shade sketched in. The base colour for the skin, or rather the mid tone, was Vallejo Camouflage Green. I applied this thinly, I wanted the primer to show through slightly. The next step was to apply the shading more neatly, using a mix of the base colour plus a darker green, Vallejo Flat Green. Again, I was hoping that the thin colours and the underlying primer shading would help here, but by now most of the underlying primer colours had been obscured by the layers of paint. The third stage was to reinforce the shading. I added a brown colour, Coat d'arms Leather Brown, into the shading mix and applied this thinly in the deeper recesses. The final stage for this session was to add some initial highlights. 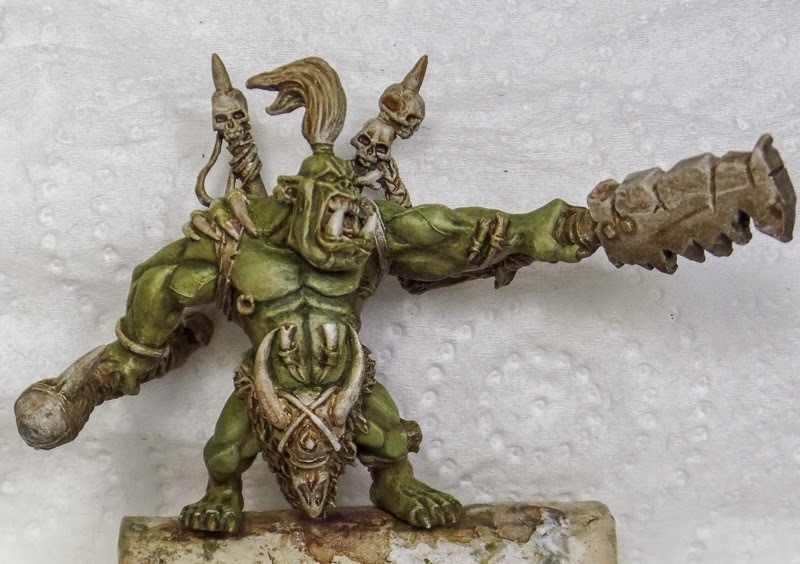 For this I turned to an excellent video guide by the ultra talented Ben Komets on the Painting Buddha youtube channel - check it out here. I tried to apply the paint using the wet in wet technique, not as expertly as in the video but I thought it worked out quite well for a first try. One of my great painting faults is to keep everything too subtle, so this time I am trying to keep quite sharp contrasts between light and shade. My instinct is that it's too much, muscles do not have sharp highlights like that on the left leg, but I will probably smooth it over with a glaze or two later. That's all I managed in this session of about 90 minutes painting. The underlying shade and highlight provided by the primer has been useful - not so much in the obvious places where you would naturally put your shade colours, like in the creases of the abdomen, but more in the areas where light transitions to shade at a gradual level - the upper and lower outstretched arm is a good example of this.